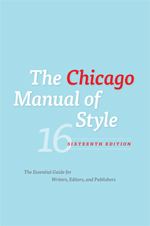 The Chicago Manual of Style (CMS) is most commonly used to write papers and cite sources within the humanities. Use this link to learn how to use databases to help you cite your research. Sample Chicago Style paper with notes and bibliography (Purdue OWL). Where librarians go when they have questions on CMS. Information on general format of CMS research papers and PowerPoint presentations from the Purdue Online Writing Lab at Purdue University. When you're done researching, you're also done with your references or bibliography page!